Like just about everyone, I have many mixed feelings about James Franco. One of those feelings is wondering just how he can write, direct, and star in everything he comes into contact with. What has he taken on now? Directing an adaptation of The Garden Of Last Days. Who does he have to star in it? Emilia Clarke, best known as Daenerys Targaryen on Game Of Thrones. The Garden Of Last Days is based on the book by Andre Dubus III, who also wrote House Of Sand And Fog. It tells the tale of a Florida stripper who happens to bring her daughter to work on the same day that she danced for several terrorists that were involved in 9/11. 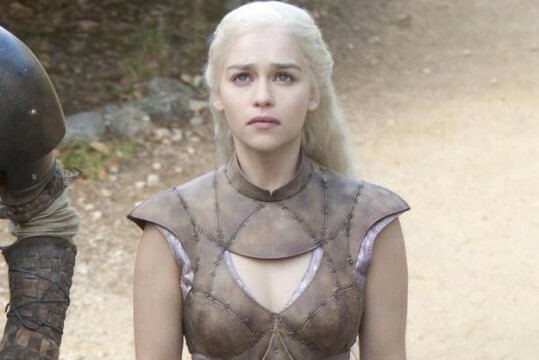 So once more, Emilia Clarke will take her clothes off for our edification, in the service of art. I’m certain that James Franco will be very appreciative. Franco’s adaptation is apparently somewhat low-budget, though, and that does not make me feel warm and fuzzy about its potential. Nor does the fact that Jimmy has been taking on about a thousand different projects at once, many of them from complex and difficult novels: Cormac McCarthy’s Child of God, William Faulkner’s As I Lay Dying, and his rumored adaptation of James Ellroy’s American Tabloid. He’s also appeared in Spring Breakers, Oz The Great And Powerful, and the more recent The Iceman. He will also be seen in This Is The End, and the biopic Lovelace. Sheesh. Where does the guy find the time, I wonder? Or does he? Emilia Clarke, meanwhile, will be seen in British crime movie Dom Hemingway, alongside Jude Law. And, of course, right now on HBO in Game Of Thrones, with her cute little pet dragons. The Garden Of Last Days will start filming in July. I have no doubt that James Franco will write and direct a documentary, then street performance piece, about its production.